I had one of those mornings yesterday where I didn’t have time to grab breakfast. While running an errand in the Hospital District, I found myself standing outside of Mount Sinai. 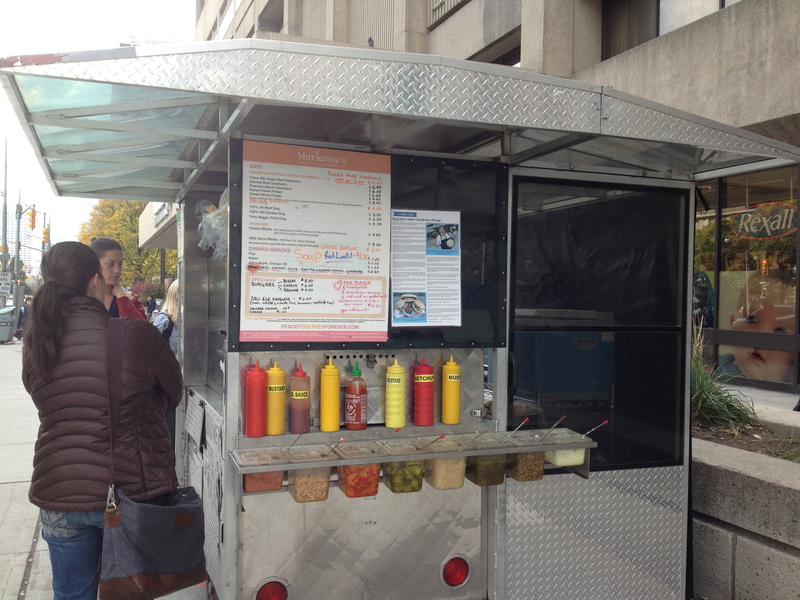 With that annoying question of ” What should I eat?”… Before I could finish that thought, I saw a hot dog vendor and noticed an extensive menu board. 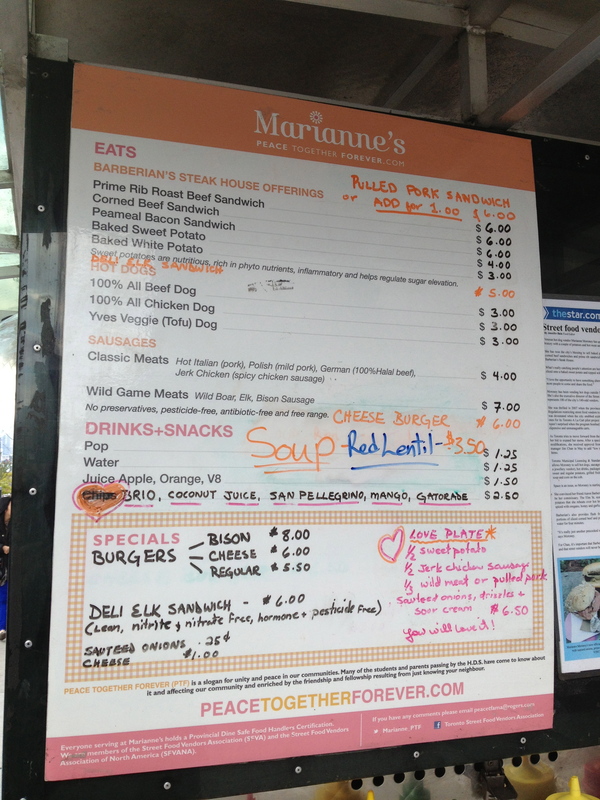 Marianne’s Menu Board. The LOVE PLATE is on the bottom right. 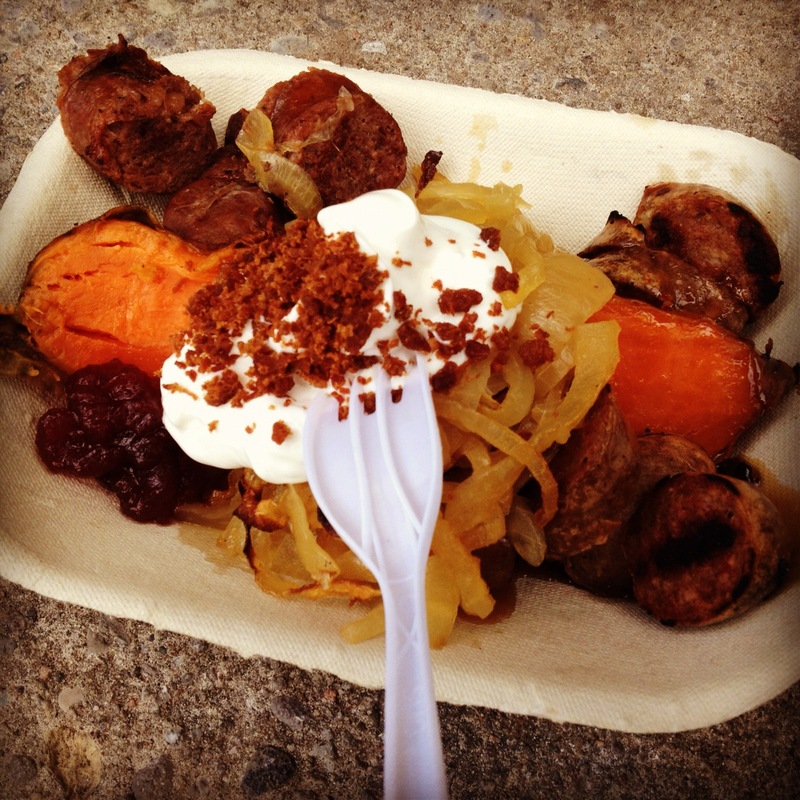 Love Plate: Jerk Chicken Sausage, Elk Sausage, Onions, Roasted Sweet Potatoe and Sour Cream. I wish it was double it’s size. Mainly because, I didn’t eat breakfast so I was playing catch up with my meals. It never really works out (How did I do that in highschool and university? crazy.) Overall, it is a great spot to grab a quick bite on the go. A nice alternative for those of us that don’t always want to have bread with our meal. Anyways, check our Marianne’s for Regular sausages, wild game meat sausages (elk, bison). She has regular baked potato or sweet potato to choose from as well as a few sauces: wasabi, apple cinnamon and cranberry lemon. I got the cranberry lemon. To read more about Marianne, check out this Toronto Star article and all the rave reviews on Yelp. What delicious meals have you had on the street? I would love to hear from you and learn about great places to try in the city. I rmb having this jerk chicken roti from Toronto a la cart that’s on bay and king which I thought was pretty good cause they put mango salsa in it. Yum! Jerk Chicken Roti sounds delicious. Mmm, so many options! Those sauces sound interesting. Also, I had a question about the blog. Could you email me when you have a second? Thanks Julianna!